Nostalgia is a powerful thing. Sometimes it makes bad things seem good. Take, for instance, the 1989 horror flick “Pet Sematary.” It was a modest success at the time when the horror genre was in a bit of turmoil. Slashers were slowly on their way out and no one knew what to do with the genre. Why not visit the Stephen King well again for what the author has described as his scariest book? “Pet Sematary” as a film is fine but it’s not very good. It certainly doesn’t hold up that much today. Even if the two year old playing Gage is pretty decent considering he’s essentially a baby, the daughter is pretty terrible. The film gets bogged down in boring side plots – who the hell cares about Rachel’s sick sister? The only reason the character scared kids is because she’s played onscreen by a man in horrible makeup. The story of “Pet Sematary” is great, but the final product, for all intents and purposes, is sort of a mess. And it’s not scary – disturbing perhaps – you certainly won’t see a studio film made today with a two year old coming back from the dead killing people with a scalpel. The film was essentially a horror film about grief another recent movie to tackle the difficult subject matter was last year’s Hereditary. And now we get another version of “Pet Sematary” that fixes everything that was slightly wonky about the 1989 version and has a few fun twists up its sleeves. 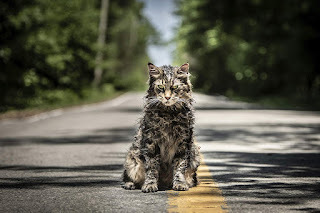 The new iteration of “Pet Sematary” is pretty similar to the original film for a majority of the time. A couple moves from the busy city to the rural comforts of Maine. There’s Dr. Louis Creed (Jason Clarke) his wife Rachel (Amy Seimetz) and their young daughter Ellie and baby Gage (Hugo & Lucas Lavoie). Ellie also has a cat named Church. They meet a weird but nice neighbor Jud (John Lithgow) who sort of becomes a father figure to the family. Things seem to be going ok until Louis begins having weird visions of a college student who was recently hit by a car and killed on the campus he works at. Oh and there happens to be a pet “sematary” in the woods behind the Creed’s house where all the kids in the town bury their dead pets. And there seems to be something slightly evil just beyond the pet sematary. In fact its an ancient burial ground that brings dead things back to life! So when Ellie’s cat gets hit by one of the many speeding tractor trailers that whip down their road, Jud recommends that Louis bury the cat in the place beyond the pet sematary. Ladies and gentlemen, I give you zombie Church. The cat in the original film looked evil before he was killed and zombified. The Church in the new film is precious looking and then is all mangey. At this point we all know where the story is going but the film plays with your expectations to the film’s – and our- benefit. Screenwriters Matt Greenberg and Jeff Buhler have fun playing with an audience who they know is seeing the film because they know the original movie. Directors Kevin Kolsch and Dennis Widmyer know that too. But they also know how to make this story scarier and fix things that didn’t work in the first film. Rachel’s sister Zelda still figures into the story but is handled in a much better way as are the overall themes of death, grief, and the afterlife. Stephen King has essentially given us a zombie story but told through the point of view of a family dealing with tragedy. That’s why this story still resonates today.